John McCain demonstrated today why Mitt Romney's business experience makes the former Governor of Massachussets better qualified to be President of the United States. The two men are engaged in a tough contest for victory in this Tuesday's Michigan Republican Primary. Michigan is a state that's been hit hard by the reverses in the American auto industry, with both Ford and GM headquartered in Detroit. 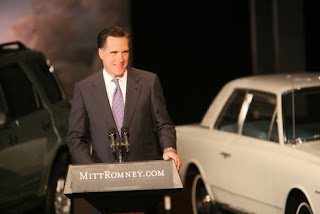 Romney's father, of course, served as Governor of Michigan during the 1960's, and before that was President of American Motors, at the time the fourth and smallest American automobile manufacturer. 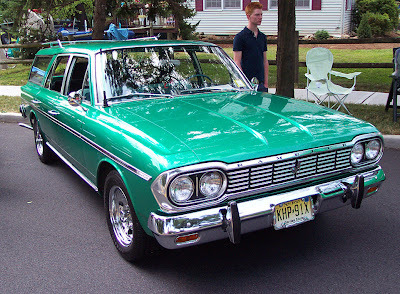 Remember the Rambler ? That was an American Motors car. In Saturday's debate, held in Michigan, Senator McCain made a statement that you might expect to come from a big government Democratic Senator with no business or private sector experience whatsoever. The Federal Government, he argued, had helped American automakers by passing stricter fuel efficiency standards last month. McCain's loopy reasoning was that the standards would motivate manufacturers to develop more fuel efficient cars that relied less on foreign oil. "I have great faith in the auto industry that they'll be able to meet these ... standards, we'll move to hybrid cars, we'll move to hydrogen, we'll move to batteries, and I as president will do everything I can to help them do that," he said. The practical Romney, whose business success was the result of an ability to differentiate wishes from reality, understands the situation more clearly. Arbitrary standards, he argues "help the foreign manufacturers and hurt us." Romney's quite right in that assessment. American manufacturers typically have a product mix that features larger cars which naturally have less fuel efficiency. Fleetwide standards force American manufacturers to change their product mix in ways that are not advantageous to their niche in the market. McCain's comments show a fundamental misunderstanding of how business organizations actually work and get things done. Apparently, McCain thinks that business executives, and auto executives in particular, are a bunch of dullards who are not smart enough to determine the right strategy for their business. Only the "smart people" in Washington, it seems, know that the right strategy for the American auto industry is to make automobiles with a particular fuel efficiency ratio. Oh, and by the way, the Washington "smart people" know EXACTLY what that fuel efficiency ratio should be ! From a strategic and operational viewpoint, there's no question that some component of the decline in the performance of the American auto industry is the consequence of poor strategic decisions by American auto executives, and good strategic decisions by executives at Toyota, Nissan, and Honda. Part of that is as it should be -- Toyota Camrys run forever and rarely need service, so the marketplace CHOOSES Toyota Camrys. But consider the real economic harm--the interference in free market forces-- caused by the arbitrary increase in fuel efficiency standards recently imposed by Senator McCain. The marketplace says-- we like the large SUVs made by General Motors, especially the Tahoe. Raising the fuel standards across the fleet increases the costs of producing a Tahoe significantly more than it increases the costs of producing a Toyota Camry. Why ? It's a much bigger car, and the resources required to hit the new target are greater. To get around some of this silliness, many American automakers have focused on making pickup trucks (which have different standards than passenger cars) look and behave more like passenger cars. A great accomplishment in itself, and a good fall back position, but without Washington's intervention, Ford and GM might well have placed their resources in other areas of innovation -- areas that the marketplace values more highly. If McCain ever had a job that depended on understanding the market, he would have known this. A McCain Presidency, on the economic front, would look a lot more like the command and control economic failures of Jimmy Carter than the free market economic successes of Ronald Reagan. Excellent article. Politicians don't think like business people, and it shows. Among top business executives, Romney has proven himself, over and over. The guy knows what a balance sheet is, and a whole lot more. If this country passes on Romney's expertise, it deserves more of the same nonsense that got us where we are. I like the way you think. Wish there were more of you. LSU -- our 12-2 National Champion !